November 2016 - An Opportunity to Celebrate Life! My chest aches. I’m not finding much comfort in my furious friends who are ready to fight back. Which is odd because generally I’m the first person to fight for the underdog. But as I listen to the anger, projected on the people who didn’t vote, the people who did but voted for Trump, I don’t feel good. I feel icky. 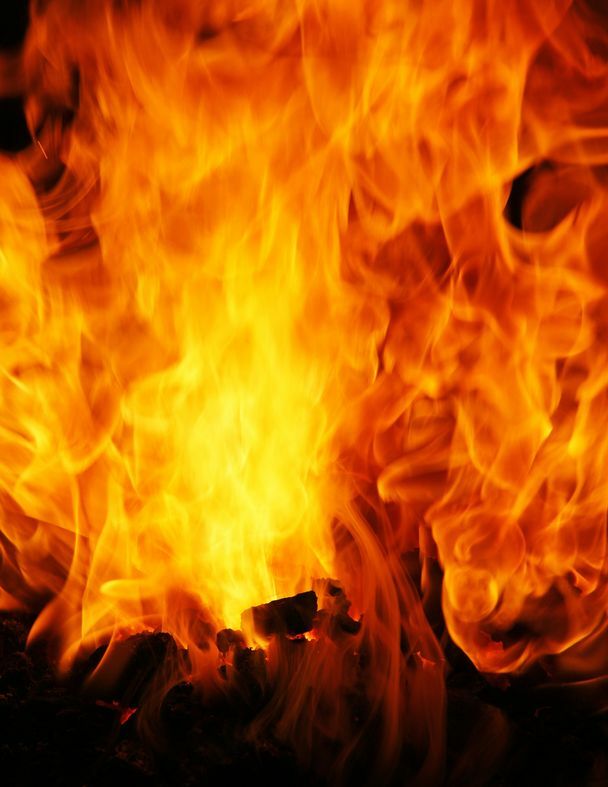 When I watch the American flag being burned by people in one of our ally countries – I feel sad. I want to write my international friends be they in Canada, UK or Mexico and ask that they hold their fire, please. Yes, we are a country in deep conflict right now. The full extend of the division of our united people is easily seen through the election where Trump won as a self-proclaimed racist, xenophobic, sexist white male by getting the electoral vote. However, Hillary won the majority vote of the people. One a neo-nationalist, Trump and one a neo-liberalist, Hillary. I like Hillary. Where I may have failed my neighbor is not going below the vicious hate I saw being directed at her. I didn’t like the delivery and so just dismissed it without speaking up. With Trump, I haven’t been able to get beyond the vile presentation – the bullying, child-like behavior whenever there’s negative feedback and a general lack of respect for the job is being asked to take on, the Presidency of the United States. As a result, I did not hear the real pain of half of my country. I am getting an understanding of it now. There are people who sit in the middle of our country who don’t believe their opinions and views are being heard. They believe government is focused on programs for people other than themselves, and they are being asked to pay for those programs when frankly, they are not making enough money to do it. There are people who carry guns and use them well and don’t want gun controls that will infringe upon their rights to responsibly bare arms. There are people who live on the border of Mexico that have had to face and deal with challenges due to illegal immigrants, and worry that if they say anything they’ll be called a racist. I think white men and yes, some white women, feel threatened by being told they’re privileged. These people are told to shut up, it’s no longer your turn and they just don’t understand the impact of their so-called privilege. These are just some of the issues I think Trump spoke to and as a result this LARGE group of people felt heard. Do I agree? Well, that is not the important point. We all want to be heard. Often we can live without getting our way if we believe someone has truly heard us and considered our point of view with real interest and regard. I am not sure I have done that to those people, which is why my heart aches. Because now I will be living with a President that did listen. I’m not really sure I believe he has good intent for those that he stirred up, but he did listen and did it better than most of us. So for all my desire for equality and freedom for all – I failed. I don’t want to keep failing. I also don’t want to see us lose the ground we have gained because we have made progress. I will still speak up to racism. I will speak up to sexism. But I want you to know, if you don’t realize already, that racism, sexism is within each of us. It’s not relegated to privileged, the rednecks, or Trump. In my opinion, we’ve got to start really listening to each other and not just fighting back and continuing the cycle of winning and fighting again. Yes, be angry and find ways to express that anger responsibly and then get back up and relate to each other! Because “We The People” are ALL people – not just the ones who agree with me and even those people who hate me because of who I am. I know that is painful. I’m not great at listening without defending myself especially when someone is attacking. It is hard to stay open and be curious. However, I can’t just keep saying my own point over and over again. Or run the people I hate out of town. Frankly, I think the only way to break out of this hell we are now in is to actually try to listen. Not to the press, not to the media but to my neighbor, your neighbor who very well might have voted for Trump. I am sitting pondering what to say after reading the headlines about where we are as a country. I don’t want this to be a political post about who you should vote for or why. Sure I have a opinion and I have voted. Probably so have many of you. Plus a lot of my regular readers are Canadian so just watching and wondering – what they hell are we up to! It seems people around the world are watching and mostly either laughing, crying or fearful that somehow democracy has failed in a country that was founded on the idea and stood strong in defending those noble roots. It would be so easy to just make this mess all about the names on the ticket – Hillary and Trump. To make the issue about how they are such poor options. That is such a cop-out. Whatever, is surfacing is something each of us is participating in. I am a believer in using conflict and this situation is putting that belief to a very strong test. I work with individuals, couples, leaders and teams. I speak to the importance of being willing to be vulnerable and curious. Yet, I admit I have struggled to stay open and when people ask me what I am doing to make a difference. I admit I have many times remained hidden in my opinion because of my fear of rage, retort and the venom that comes back. So I have to ask myself, what will I do and who will I be on Wednesday if the elections results reflect something I don’t like or fear. So much of this election has been about fear and hate. I am not talking about the candidates, I am talking about us, the people. I’d like to say – not me. But I can not say that. I have moments of rage, hate and fear. I have protected myself from owning my own shadow by projecting it out on people I thought were far worse. But if I am honest and do the only work I have any control, I most look at my own part in this crazy process. Maybe I am not standing on some political stage where everything I do is reviewed. Maybe I don’t have the power to let my own fear and hate change the state of the world. No, I don’t have control over armies, bombs or people’s right to seek refuge. No, I don’t have that kind of reach. But I would be kidding myself if I didn’t know my interactions matter. I do and can make a difference. Maybe not on the world stage but how I could I possibly know if that one person I screamed at in hate or recoiled from in fear won’t have the power to self-destruct or destruct a family, a community or country some day. How could I not know that one kind and honest conversation made someone else do the same. Don’t get me wrong I am actually not suggesting that making all my interactions positive is the solution. Because frankly, I think that approach is just as damaging. I mean show up real, raw, vulnerable. Owning what I am thinking without just projecting it out without awareness and choice. That is not an easy task. But I do think one worth living. I think it is the only real path towards intimacy and connection. I also believe that to be human does mean we will make mistakes. But we can recover if we are willing to look at our own part and not make it something outside of ourselves. I have spent years working with couples and so often couples arrive in a crisis because of a big event – an affair or some type of event that seems to crack instantly the foundation of trust and possibility. However, over and over in working with these couples I see that it isn’t the big events that ripped at the foundation but the little things that never got talked or addressed. I think that is the issue in our country. Our politics are simply a reflection of not dealing directly and honestly and with each. This hate didn’t just surface because of Hillary and Trump. We have been on this trajectory for a long time. Now we have surfaced the beast inside. Will we embrace, look at and own it? Or will we try to kill? The challenge is not an easy one. It is one that can only take place in the hearts and minds of each of us as people. This isn’t just a political problem. I want to wake up Wednesday and have my person win. I admit it. I think the world will be a better place. But I do not know that I am right. It’s my story – a story – not truth. What I do know is that whatever happens, I want to wake up on Wednesday (actually every morning) with a renewed commitment to not point the finger outward but to turn 180 and ask myself how will I participate in the interactions where I can have an impact? 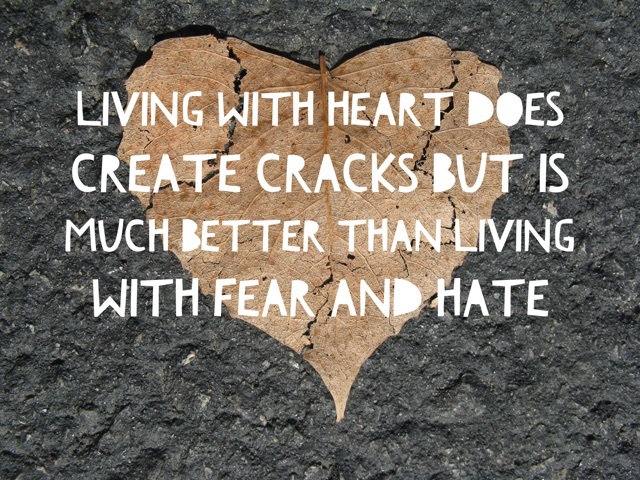 Will I live from my heart or from my fear and hate. That my friend is the only thing any of us can do – including Hillary and Trump! I have faith that all people have that as a choice! I even have faith in Hillary and Trump. I have faith in my ability and yours to make a difference one interaction at time. I really don’t even need to wait until Wednesday, neither do you. We can change the trajectory now! Yes, we are cracked – but I don’t believe we are broken! I am not good at finishing! As a very immediate person, I get myself distracted easily. The strength of this personality trait some might say is adaptability. Although I am not so convinced this trait is a strength. There are too many signs of unfinished failure that haunt me to think otherwise. My book, scattered pieces on countless computers. My closet, always piled with clothes. You might think I never do laundry! These are just some current day indicators of this ‘strength”. No, I think there is something else all together at work here. 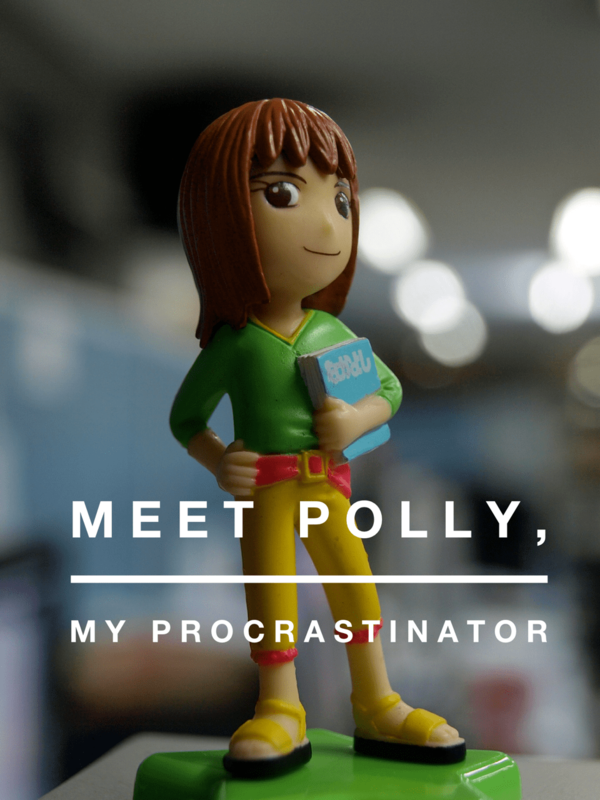 Myself, I have come to believe, Polly, my procrastinator is the real instigator of my unfinished mastery! Polly, has been an important protector of me over the years. Believe or not, her amazing efforts have kept me from humiliation and criticism many times. Her ability to stall, distract and avoid detection has been valuable but may be a bit over done these days. At other times in my life, writing and sharing my story was dangerous. My messy, chaotic presentation kept me well under any radar and able to avoid getting too far out into the world where I might create problems for myself. Yes, there was a time in my life where Polly served me – but not so anymore! The problem is Polly remains on high alert! Let me give you a bit of a day to day look at how Polly shows up in my world now. I decide I want to write this quick post about procrastination. I start typing and decide it would be good to look up the word procrastinate. As I am googling the various definitions and diving into the root of the word, I discover a variety of interesting headlines about procrastination. One, Two Harvard Professors Reveal One Reason Our Brains Love To Procrastinate (I take a quick look but find it boring). Two, I find Later, a New Yorker article about a Nobel-prize winner’s relationship to procrastination (which I find much more engaging of course it starts with a cool story. Plus, who doesn’t want to be compared to a Nobel Prize winner?!) and finally, a TED Talk by a known pre-crastinator who took on the task of learning to procrastinate because he missed out on a big investment opportunity by quite harshly judging a couple of his students who he wrote off as losers due to their procrastination who in the end made millions. While Polly has found relevant information thus far, she doesn’t stop there. Soon I am reading political headlines about our upcoming presidential election, which reminds me that I need to call someone about our upcoming weekend program Find Your Mojo In Montana. So I get on the phone. Then I realize I’m hungry, and we have nothing for dinner. So I get ready to head out the door to the store and think, why not take Rosie to the dog park? She needs the exercise. I better grab a snack before I go. So I wind up making a shake. Needless to say I am soon far, far away from finishing the post and focused in a totally different direction! Why is Polly protecting and procrastinating this time?! Polly means well. She loves the rapid intake of information, with a preference for quick reads and engaging activity. She loves gathering random bits of information and finding common threads. She is also very immediate, meaning if she gets bored she’s moves on – thus the inability to read through the Harvard article and get some tips on how to be any different!! This is not an uncommon course of events for me and Polly! Sometimes I love the variations and distractions. But Polly and I have had to develop a better working relationship. This day’s activity though demonstrates relationships aren’t about being perfect! My relational efforts with Polly are the foundation for my new Building Your Mojo program is designed to help people like me develop their own working relationships with parts of themselves that are stopping them from reaching their fullest potential. See Building Your Mojo Program! is the outcome of how I have learned to relate and develop a much better working relationship with Polly. I am putting her various skills into practice so that instead of stalling and never crossing the finish line, I am moving and making progress! Not everyone has a Polly, but most of us do get stalled along the path to some of our most important goals. That doesn’t have to happen! There is a way through! I ran the beta test last month with a fabulous group of folks and got some great feedback. I have been on shut down for four years due to several traumas. I was suffering from depression, anxiety and I suspect some PTSD. I participated in Susan’s ‘Build your Mojo and Accomplish Your Dreams’ for a few weeks and found it to be really inspiring and I did actually put my foot back in the water. The whole idea is about living the best life you can and this experience has opened my mind up to possibilities I thought were no longer available. I am currently volunteering and thinking about spending a few months in Mexico. A huge step for me and all due to Susan’s leadership and suggestions. I am now launching a new program. Click this link to learn more. I love the group sessions because these sessions are interactive and engaging. But I also get that there isn’t always time to dive in and work more individually with someone when things come up. I found people really got value out of having some one-on-one time to help them work through their Polly issues. So I am offering a coaching package alongside the four week group sessions to give you personalized support. You can find it on the same page. I love that I’m finding a new job for Polly! What better way than to use all of her ample skills than to help others transform their procrastination and tap into and build their own Mojo to move through blocks and stalls. She’ll be answering emails, coaching people, and prepping and delivering the live classes, or running the store or checking Facebook. If you already know you have your own inner Polly to work with – well check out Building Your Mojo on our thrive! site! Don’t procrastinate – sign up now! I’d love to play and engage in online learning and relating with you!